OneNote is integrated into Windows. Hit Win+N and you can create a sticky note-like note instantly in OneNote. If you have a touchscreen Windows PC, OneNote lets you change the UI to make it more touch-friendly. OneNote works betters with the Microsoft Office ecosystem, of course. You can add reminders to text in your note via Outlook, share OneNote notes or notebooks on SharePoint with your company (paid version only), or embed Word, Excel, or Visio documents (and edit them in OneNote). In two clicks, you can add meeting details from Outlook to OneNote, which is probably why Lifehacker readers voted it the best meetings minutes service. OneNote has rich collaboration features not available in Evernote, such as seeing revision authors and finding comments by author. Paid OneNote users (e.g., in the corporate environment) have many more note-sharing tools and notes revision histories features. You can drag-and-drop files as embedded objects in OneNote. For example, if you drag a document to OneNote as you (even a Google Docs shortcut! ), you can insert it as an attachment or embed it in full as a printout. In Evernote, a similar document can only be added as an attachment. 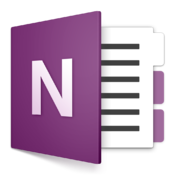 If you want to export your OneNote notes, you can do so in more formats: In addition to the proprietary OneNote format, you can export entire sections or pages at once into PDF, Word, or HTML. Evernote only lets you select notes to format into its own format or XML or HTML. This entry was posted in eLearning, Technology and tagged Apple, EverNote, Information and communication technologies in education, Microsoft OneNote, Microsoft PowerPoint, St Andrew's College, Technology, Windows by Sam McNeill. Bookmark the permalink.